There is something distinct and powerful about naming your debut album after the name of the supercontinent that supposedly existed 300 million years ago. There is a scope and vision that, in the hands of other artists, would seem trite and hollow. In the hands of Toki Wright and Big Cats, the rapper and producer who are undoubtably at or near the top of the respective fields as they made this record, the title is a clarion call for an LP that feels both like an instant classic and also a glimmer of what hip hop, and music, could possibly uncover in the future. For this project, Big Cats took the method he used so well on For My Mother, his instrumental hip hop record he wrote and recorded in dedication to his mother after she passed away last year. 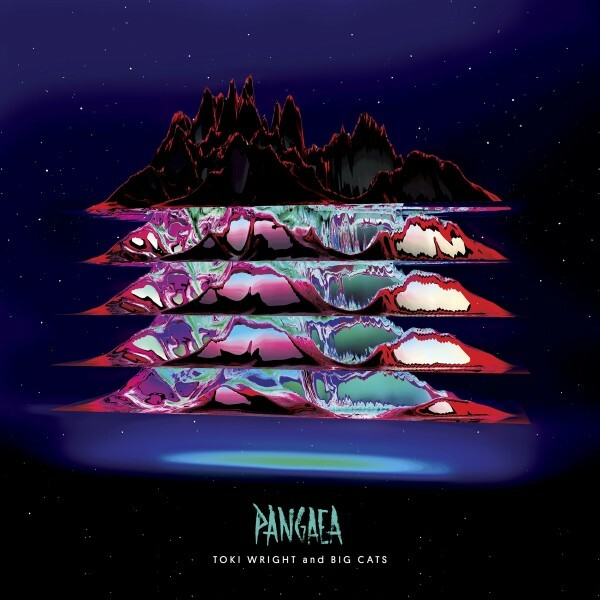 Like on that record, Big Cats took live musicians, recorded their music and used that to make the samples for Pangaea, a move that adds texture and color to the tracks. Pangaea is impossibly lush. The drums are rich and deep, the horns and synths give the impression of neon glittering off rain in the dead of night in the heart of the city. From the clapping drums and squalling chorus of “Overhead” to the bruised soul of the title track, Big Cats stretches his talents into every corner imaginable. For an album that features the in-depth and imaginative lyrical work of Toki Wright (not to mention countless talented guests), it speaks to Big Cat’s talents that the sonic pallet that this album rests upon is something that I keep finding myself getting wrapped up in weeks into listening to this record. For too many artists, they barely dip their big toe into the water and it already seems like they are in over their head. Toki Wright? He jumps in the deep end, peeling back real life scabs that our society has been casually scratching at for decades, and he makes it look effortless. Toki Wright has proven his credentials as an MC that not only does he have the skills that lift him to the top of the game, but has an intellect and humanity that sets him apart not only locally but on a national scale. His rhymes are fluid, but deep, matching Big Cats ambitious beats every step of the way. They are at times rapid-fire, and at times languid and almost spoken word. Jumping from the problems facing our own city to larger socio-economic problems to issues facing his life, Pangaea feels, as much as any classic hip hop record, like a snapshot of real life. Usually I would pull out a song or three that highlight how well he does this, but selecting one or two wouldn’t do his work justice. Every song on the record has moments, and most are gripping explorations that, if not for the great song that follows, would force you to infinitely his repeat. If there was a supercontinent hundreds of millions of years ago, it would have brought together disparate lands and species into something larger than the sum of its parts. When thinking on that, it is clear that this title is perfect for this record, as even dozens of listens in it still feels astonishingly large and complex, but locked into a single place that gives it a shared humanity. Pangaea is clearly a high water mark for both of these artists, and is a stunning document of their talents. The duo are doing two release shows this weekend. Friday night they will be with POS at Icehouse for a 21+ show, and Sunday night they will be with Greg Grease at Intermedia Arts for an all-ages show.